Seeing as this was the first time in a while that the whole family is free on a Sunday afternoon and we had no other plans we decided to go spend some time on the beach. When we do get a chance to go to the beach the Bluff beaches (Anstey's, Brighton & sometimes Garvies) are our usual hangout, but this time we wanted to go somewhere different. Since being back in Durban we've been a few times each uMhlanga and North Beach. Both have their merits but uMhlanga is a little far from our home in Queensburgh, although I have to say it is probably the best maintained beach area in Durban. 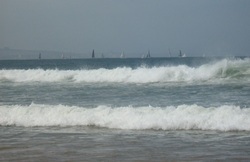 New Beach (formerly North Beach) always brings back a lot of memories for me of my teenage years in Durban. Unfortunately every time I go there I come away with mixed feelings. The nostalgia is always enjoyable, but spoiled somewhat by the slightly unkempt appearance of the area and the remodeling work that seems to have been going on for at least a decade and never gets finished. 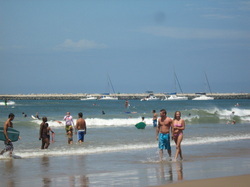 So for a change we decided to spend some time at uShaka beach. The whole uShaka complex was built while we were living in Johannesburg so I've only recently become familiar with it. Aside from a few walks among the shops and along the pier (the photo that heads this blog was taken on one of those occasions), and one short walk on the beach I haven't really spent much time there. We enjoyed the experience. 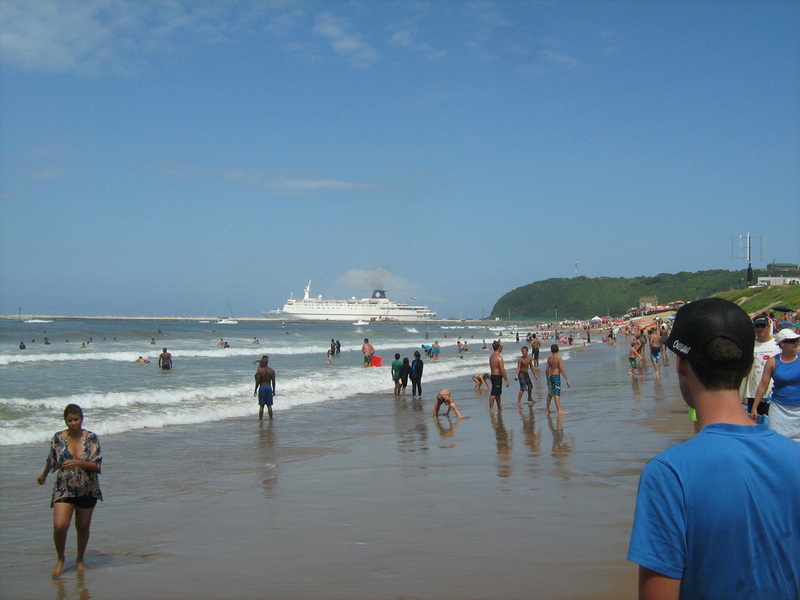 The beach is fairly well maintained and litter-free. 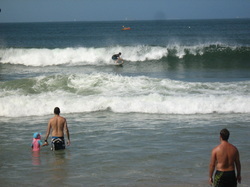 It was fairly busy and because the beach was substantially narrowed by a high tide it felt a little crowded at times. We, along with several other families, squeezed in under the pier to get some shade. While on that topic, a few shelters (like the thatched ones at new beach) would definitely be welcome. I've always enjoyed watching ships move in and out of the harbour and find it very sad that North Pier is now off-limits to ordinary residents (and ratepayers!) of Durban. I remember many happy times spent sitting in the car or on a bench at North Pier watching the ships on one side and looking at the city skyline on the other. 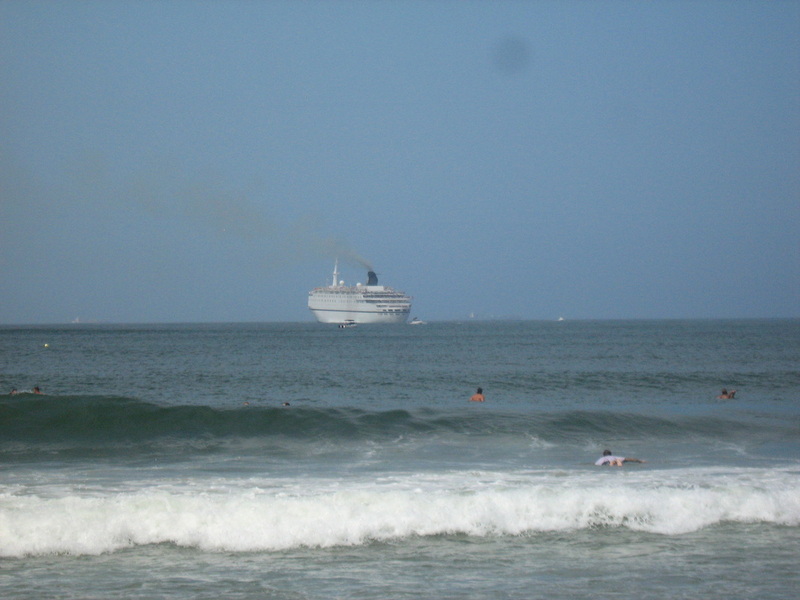 While we were at the beach we saw a cruise liner putting out to sea, I think it was the Sinfonia, and a cargo ship coming in shortly after. 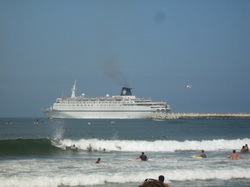 It looks like uShaka beach, and its pier, are now the best options for ship-watching. All in all it was a good day and we will definitely go back soon. On 30 April 2010 the old Durban International Airport (previously Louis Botha Airport) was closed and on 1 May 2011 its replacement, King Shaka International Airport, was opened. The old airport was located approximately 20 km from the city centre alongside the N2 South freeway between Durban and Amanzimtoti. The new airport is located approximately 35 km from the city centre alongside the N2 North, between Umhlanga and Ballito. The building and opening of this airport was highly controversial with numerous allegations of graft, corruption and tender rigging flying around in the media and elsewhere. I've also read comments in the press from players in the tourism and aviation sectors who feel that the new airport was unnecessary, unwanted and a colossal waste of taxpayers money. The consensus among these people is mostly that the older airport should have rather have been upgraded. In fact the old facility was substantially upgraded and extended a few years ago, an exercise which now seems to have been futile and another waste of public funds. Anyway, with all that said I must confess that I had never visited the new airport until last Sunday night. It was an interesting but not impressive experience. If I had to describe the new airport facility in a single word the word would be soulless. The heavy use of grey, on the floors and elsewhere, is uninspiring and reminiscent of the décor of many government buildings. The internal signage and advertising for the most part looks tacky and like an afterthought, manufactured when the budget was almost used up. The metal decorative trim above the check in desks is reminiscent of a palisade fence that has been turned on its side. Apt maybe, but ugly nonetheless. The external signage is mostly notable by its absence and the signs that do exist have such small writing that you are right in an intersection before knowing which way to turn. If the signs were bigger and mounted overhead (like at the old airport), it would be possible to plan ahead and get into the right lane in time. Finding my way into the parkade for the first time was a bit tricky and I do not remember ever struggling as much at the old airport or even at its counterpart in Johannesburg. My single biggest disenchantment though was the lack of a viewing deck. An airport is just not the same if you are unable to see the aircraft come and go on the runway. Possibly this is why the place felt so soulless to me, it's like going to a harbour and not being able to see a single ship. The overall impression is a cross between a home affairs office and a large, ugly shopping mall. Strangely enough, despite the airport bearing the name of King Shaka I didn't see a single thing linking the place to the famous Zulu King. I believe there was originally a large statue of Shaka outside the airport building but it was removed shortly after the airport opened in reaction to a complaint from King Goodwill, the current Zulu king, that he didn't like it. Talk about even more wastage of taxpayers money (approx. 3 million rand was paid for the statue). Perhaps there should have been a statue of a large white elephant instead. Although, come to think of it, when Andries Botha (the same sculptor who created the Shaka statue) was commissioned to create a series of elephant sculptures at Warwick Junction, at a cost of 1,5 million rand, they were also removed after complaints from certain individuals within the ANC that the elephant is a symbol of rival political party, the IFP. 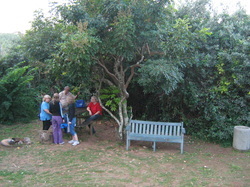 even better if it is a campsite in the middle of a game reserve. It is not always possible though to go on that trip to Masai Mara, Senegeti or the Kruger National Park. Work commitments, financial restraints and other factors make trips like this impractical on a regular basis. For some people a trip to a major game reserve may be out of reach for their whole lives. The vast majority of us also live and work in cities and spend most of our time in this environment. With all this in mind I've always enjoyed finding thin slices of natural beauty sandwiched between large chunks of urban development. In every area I've lived in there have always been nature reserves, parks, dams, rivers and little-known beaches just waiting to be discovered and explored. The great outdoors is great for a longer holiday or more adventurous trip, but for regular experience of the peace and energising effects of nature the lesser outdoors is perfect. 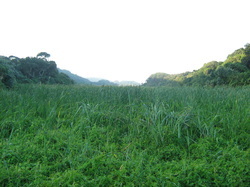 A typical example of this is the Hawaan Forest Nature Reserve in Umhlanga. I'd heard of the place before but never actually been there. In the last 6 months we have visited it twice and been impressed both times. So far we have only explored the picnic tables near the parking lot and one of the shorter paths that led through a marshy area, up through a bit of dune forest and onto a really nice beach. Looking down the valley the rest of the reserve looks very green and natural with a lagoon further along one of the longer trails. I look forward to exploring the rest of this reserve. I believe some local hiking and walking groups visit the place regularly so I will be looking into that as a way to learn about the reserve as well as meeting some people that share my love of the outdoors. 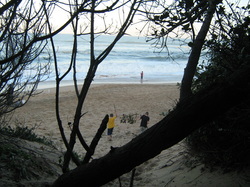 The Hawaan Forest Nature Reserve is located at the far North end of Lagoon Drive in Umhlanga. 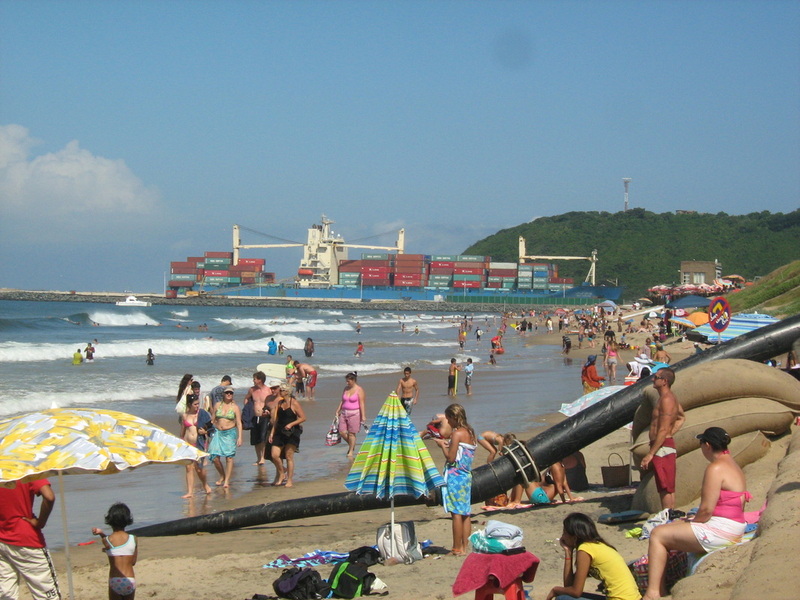 After spending 17 years (most of my adult working life) living and working in Johannesburg I moved back to Durban during December 2010. Although the circumstances surrounding the move were less than ideal and the last 6 months have been challenging and sometimes downright difficult I am still loving being back in the city where I was born and raised. 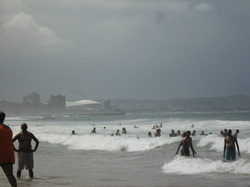 During all my years living on the Highveld I still remained a Durban boy at heart. My family have also settled in well and are enjoying having a lot more contact with the extended family as well as the laid back and easygoing lifestyle that characterises most Durbanites. One thing I noticed about living away from my home town for as long as I did is that I see it with a different perspective than I believe I would if I had lived here my whole life. I will freely acknowledge that the city is far from perfect with significant service delivery and governance failings, a severe shortage of decent employment etc. – despite these factors I still think it is a great place to live. Since being back I am re-discovering areas that I last saw many years ago and, the part I enjoy the most, discovering places I never knew existed or never took the time to explore. The focus of this blog will be to showcase interesting places, events and people in and around the city as I come across them as well as to share my experience of living in Durban and what it means to me. I love interacting with other people so comments are welcomed and encouraged. 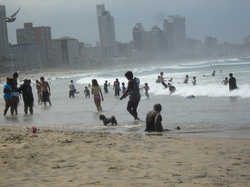 If you have something related to Durban that you would like to contribute and share please get in touch with me. Use RSS to receive latest posts Click the orange RSS button above. What is RSS?